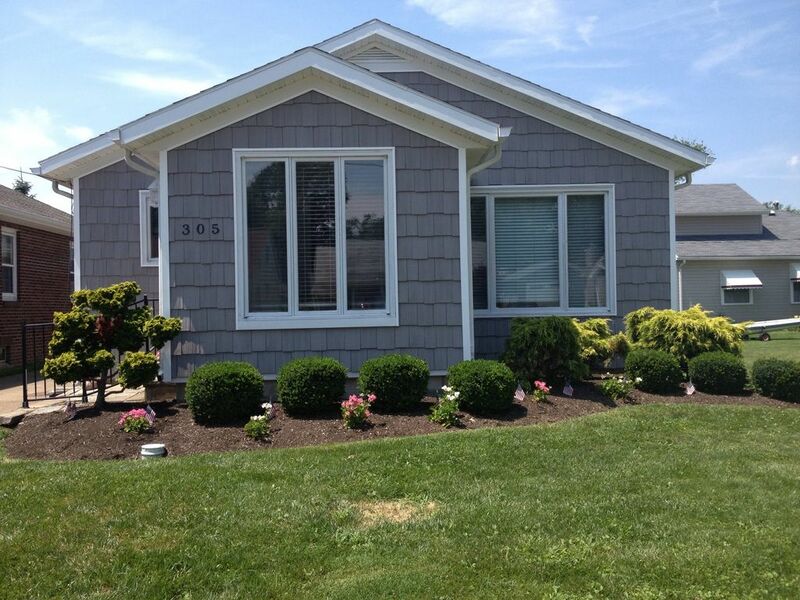 This well maintained 3 bedroom/2 bath home is located one block from one of Lake Erie's finest private beaches. It is located in a residential development called Old Homestead and is ideal for families looking to go to the beach, ride bikes, play tennis, basketball, baseball, have outdoor cookouts or spend the day at Cedar Point, Put-in-Bay or Kelly's Island. The house accommodates 8 adults comfortably and has a queen, double, 2 twins and a sofa sleeper. Additional space is available in one of the bedrooms for an air bed or pack and play. Wireless internet is available, so bring your laptop! A cleaning service is provided so you can have a relaxing vacation. A high chair and pack and play are available upon request. Driveway and off street parking available. Flat-screen TV in living room. 3 TVs, 1 in each bedroom. Quaint house that did not disappoint! Very close to new (to us) and different restaurants and short drive to Cedar Point and Port Clinton for a day trip. Pictures do not do this place justice, as it is much bigger than expected! Two families of 4 fit more than comfortably in the house! The house was beautiful. It had everything we needed. It was almost exactly the way I remembered it when I visited as a child. However, this time the bathroom was remodeled and the house has A/C. Everything was very clean. Perfect for our 1yr old, as it is all one level. Great movie selection and board games available for the kids. It was great having beach chairs, baby blanket, toys and a wagon already there. The beach is just a short walk down the road. DQ is within walking distance. There is also a Drug Mart and grocery store only 2 min away. The owner responded immediately to any questions. We are very grateful to have spent relaxing quality family time at such a gem of a place! So happy to have your family find their way back to our home to relive family memories with your children and grandchildren! Very clean, great location, accommodating owner. Great little home about 15- 20 minutes door to door from cedar point. This roomy cottage has a wonderful location ! This very clean and roomy cottage is a great place to stay to enjoy a Lake Erie vacation! The location can't be beat... Close to Cedar Point and fairies to the Lake Erie Islands. The clean beach was a hit with our family. It's only a short walk down the street. The well-equipped kitchen and laundry room where a plus. There are beach chairs and a grill in the garage. The owner, Laura, is very conscientious and eager to make your stay enjoyable! We really enjoyed staying at this property. Laura was great at communication and responding to texts quickly. The house was very clean and comfortable to be in. We loved that there were two big couches in the living room so our whole family could sit comfortably. We also loved that there is a beach about a block and a half away from the home. It is just for residents of this neighborhood so it was not busy or crowded. We really enjoyed being able to walk there. It was a great stay at a great price. Thanks for helping us enjoy this leg of our vacation.